Guy Martin on the Honda Racing Fireblade SP2 Superstock maching during practice for the Tandragee 100. Guy Martin completed his first laps of the Tandragee 100 course in 12 years as he made his roads bow on the Honda Racing Fireblade SP2 Superstock machine on Friday. Martin, who last raced at the event in 2005, went out in the Newcomers’ practice session to familiarise himself with the 5.3-mile course before completing another five laps in Superbike practice. William Dunlop on the Mar-Train Yamaha Superstock machine in practice at Tandragee on Friday. 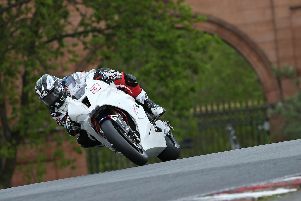 The Lincolnshire star finished 17th fastest, almost 15 seconds slower than pole man Derek Sheils on the Cookstown B.E. Racing Suzuki. William Dunlop, who is riding the Mar-Train Yamaha Superstock machine at Tandragee after Tim Martin stepped in to offer the Ballymoney rider the machine for the event, was second quickest, four seconds behind Sheils. Mullingar’s Derek McGee (Kawasaki) was next, only three tenths behind Dunlop, with Michael Sweeney, Davy Morgan and Alan Bonner the top six. Paul Jordan was eighth fastest on his Kawasaki Supersport machine behind Kevin Fitzpatrick. Derek Sheils set the pace at Tandragee on the Cookstown B.E. Racing Suzuki. In the Supersport class, Dunlop led the way on his IC Racing/Caffrey Yamaha by 1.4 seconds from McGee (Yamaha), with Skerries man Sweeney in third on his JWM Yamaha. Dubliner Sheils was fourth on the Cookstown B.E. Racing Honda, 4.2 seconds off pacesetter Dunlop, while Magherafelt man Jordan was close behind on his B&W Site Sealants Kawasaki in fifth. Tobermore’s Adam McLean rounded out the top six on his MSS Kawasaki, 1.5 seconds behind Jordan. William Dunlop was fastest in the Supersport class on his IC Racing/Caffrey Yamaha R6 during practice for the Tandragee 100.